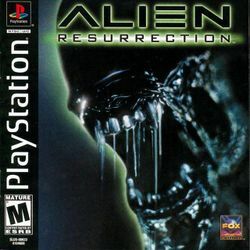 Alien Resurrection is a 3D first-person shooter based on the film of the same name. Versions were planned for the Sega Dreamcast and Nintendo 64, but were cancelled during its long development. Originally conceived as a third person action game (firstly top-down isometric shooter before switching to a Tomb Raider style), the game eventually emerged as a first-person shooter after a prolonged development period. This page was last edited on 26 January 2018, at 01:06.